If a route is open in the 21st century it will quickly become populated. 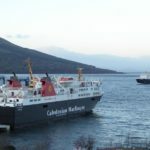 So it was on Monday when CalMac’s diesel-electric MV Catriona, one of the newest vessels in the fleet, was brought into service on the Cloanaig to Lochranza run. 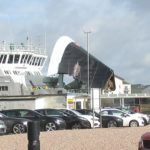 Its job, almost unbeliveably, was to alleviate pressure at Ardrossan, 125 miles away, where a crash caused a smaller vessel to be operating. The super smooth, almost silent ferry, ran a continuous shuttle and judging by the midday sailing immediately became popular. Not everyone had driven round, for some Kintyre folk it offered an easy day out on Arran. A number of Islay and whisky tourists were able to include Lochranza Distillery on their itineraries. This begs the question: Why not upgrade the single-track B842 between Claonaig and Kennacraig to improve it for winter? Springbank and Glen Scotia distilleries have found whisky tourists are not seasonal. The same will be true at Lochranza with an easy route open.